We welcome unique and specialised upholstery projects. 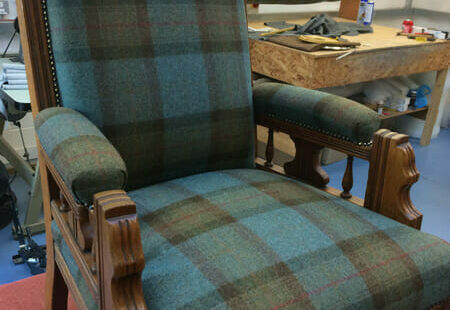 We offer bespoke upholstery in our workshop in East Lothian. Vintage chairs, sofas, headboards and footstools can all be re-upholstered specifically to your requirements in our bespoke service. We will use the most appropriate materials and fabrics and tailor these to restore your furniture and deliver the best result. Fillings, springs, webbing and fabrics are available in all sizes, types and designs so there is a huge range to choose. We have years of experience and have helped many customers with their bespoke projects. Get in touch today for a chat about what we offer. In the example this chair was recovered in a Abraham Moon fabric.